I grew up in a pretty ethnically diverse neighborhood, and with that, I got to experience and try a lot of ethnic food that isn't too mainstream. Yes, I do see the irony of what I just said: "mainstream ethnic food," but what I am talking about are things like California rolls, teriyaki chicken, pho, or galbi, things that are technically ethnic cuisine, but have become quick commonplace in the average American diet. And thus, my guide and suggestions for a couple of things to try the next time you have a craving for something exotic. Pork intestines and blood - I've seen this go by tons of different names, but this is the most generic. It is exactly as it sounds: tofu puffs, napa, mushrooms, woodear, with pork intestine and congealed blood in a delicious, spicy and garlicy sauce. I know, offal might sound offal, but trust me, it is absolutely delicious and perfect with white rice to soak up all the juices. Mandarin Squirrel Fish - Next time you are craving sweet and sour chicken, try it out instead. 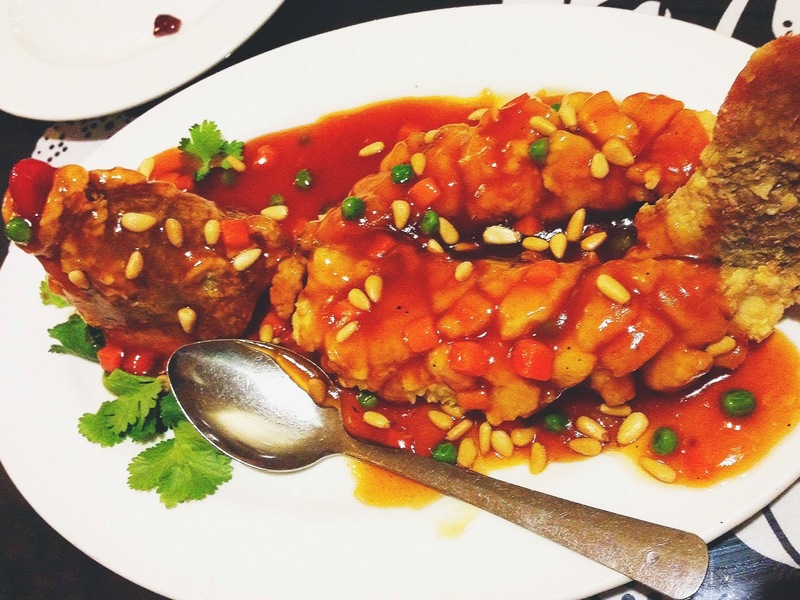 It's a white fish, filleted and then deep fried, and covered in a sweet, honey-based sauce and topped with pine nuts. Turnip/daikon cake - Typically found at dim sum places, instead of the usual har gaw or siu mai, try these bad boys. They are a savory cake made from a rice/tapioca flour base with little pieces of daikon, Chinese sausage, and sometimes dried shrimp. Crunchy on the outside, hot and soft on the inside, of course they taste best when they are pan fried as pictured above, but some places will serve a healthier steamed version. Oyster thick noodle soup - While most people will think beef noodle soup when they think Taiwanese cuisine, but frankly, I like thick noodle soup a lot better. Yes, the noodles in the picture are thin, but that's how they are supposed to be. This dish is essentially a starch-thickened soup with pieces of thin rice noodle. There are typically two kinds: a pig intestine version and an oyster version. Both are delicious, but I just like oysters better. Pork and Glutinous Rice Cakes (left) - If you like blood sausages, then you'll probably like these. Think of them as the Taiwanese equivalent: sticky rice held together by pork blood, steamed, and then covered with a slightly sweet, savory sauce and crushed peanuts. Ba Wan/Taiwanese Meatballs (right) - Similarly, for those who like sticky rice-based foods like mochi, I suggest trying this out. The outside of the meatball is covered with a sticky rice/tapioca flour based dough that is nice and chewy and on the inside there is a delicious pile of ground pork and sometimes a bit of mushrooms or vegetables. It's served with a slightly sweet, ketchup based sauce, but trust me, this is just as good without the sauce. Pork Stomach and Pickled Mustard Greens Soup - Instead of a typical egg drop or hot and sour soup, try this out. Pork stomach is very chewy and typically eaten for the texture. The salty mustard greens are extremely appetizing and the two pair together for a great, light tasting soup. Uni/Sea Urchin - If you enjoy sashimi, try out uni instead of your typical salmon or tuna. It is a bit pricy, but hey, if you are willing to shell out the money for toro (tuna belly), then the cost should be about the same. Uni is slightly sweet, briny, with a soft and custardy texture. Along with tako (octopus), it is my favorite cut of sashimi. Goma-ae - While wakamae or seaweed salad is quite popular in Japanese restaurants, I actually prefer goma-ae. It's a chilled spinach salad dressed in a slightly sweet sesame-paste based sauce. Extremely refreshing. Yaki Nasu - I love eggplant. Let's just put that out there. Yaki nasu, or quite literally, grilled eggplant is just that: simply grilled with a bit of salt and served topped with some bonito (dried tuna shavings). The flavor is subtle, smokey, and oh so satisfying. 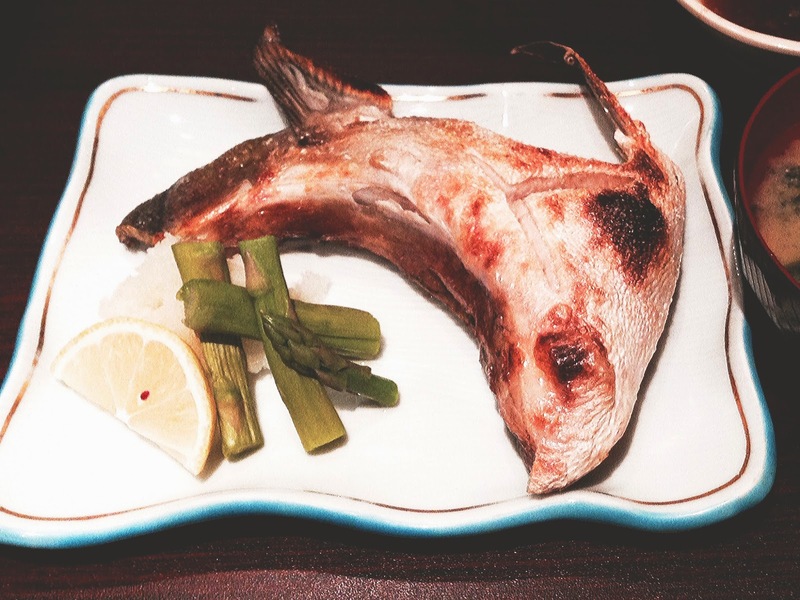 Hamachi Kama - Okay, so this looks a bit scary, but trust me, it's the most delicious way to eat fish. Hamachi kama is basically yellowtail collar, one of the most prized and tender part of the fish. Generally, it's served simply grilled with some salt and shaved daikon on the side to help balance out the fattiness. The meat is extremely tender, moist, and flavorful, the skin is nice and crispy, and it's full of healthy fish oils. Only one thing though - it can be a bit of a pain to eat because there are tons of little crevasses to dig meat out of, but that's something I'm more than willing to deal with. Com - Com is a whole range of dishes instead of just one. It's broken rice served with vegetables, meat and/or spring rolls and the ubiquitous Vietnamese fish sauce: nuoc cham. It's extremely simple, but light, filling, and satisfying. Here is a very basic com ga nuong or broken rice with grilled chicken, but I've seen it with grilled pork, sugarcane shrimp, pork patties, fried eggs, lemongrass pork/chicken, spring rolls, the list goes on and on. Ca Kho To - Translated as caramelized catfish, this dish is sweet, savory, smokey, slightly saucy, and great with simple white rice. It's generally served hot and bubbly in a clay pot and topped off with fried shallot pieces. It's another one of those dishes that goes great with rice. Oh, and many places will also have a pork version called thit kho. Bahn Xeo - This is a vietnamese crepe. Don't let the picture fool you, because it is typically HUGE and enough for two people to share and be completely satisfied. It's a super crunchy crepe made with tapioca flour and coconut milk and filled with bean sprouts, shrimp, and pork then served along with lettuce, thai basil, cilantro and nuoc cham. Just grab piece of lettuce, fill with some herbs, crepe, dip, and savor. The richness and fragrance of the crepe is balanced out perfectly by the cool, crunchy vegetables and sweet sauce, plus the hands on aspect makes it a whole lot of fun. 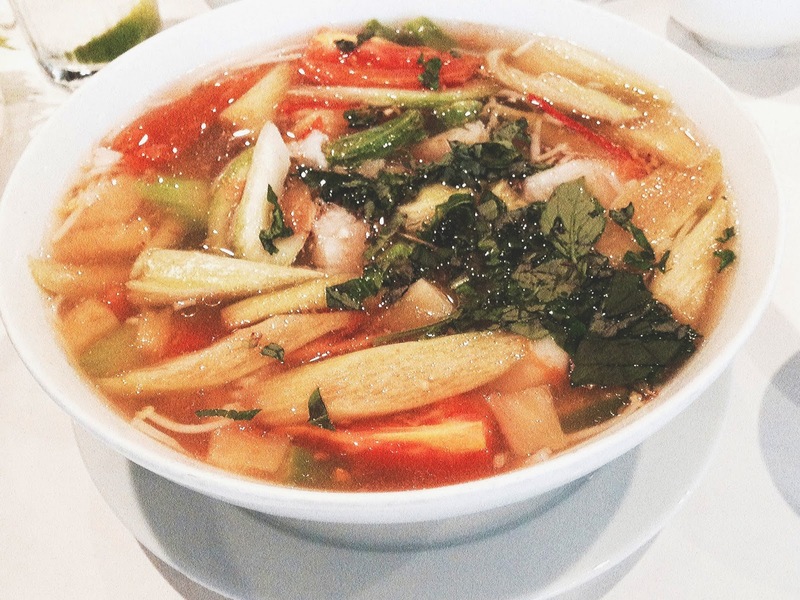 Canh Chua Ca - Translated in sweet and sour fish soup, paired with a bowl of rice, this easily is a meal. While tom yum soup has gotten quite popular, I haven't seen canh chua ca as often. It's a tamarind-based soup with catfish (sometimes shrimp) and a bunch of vegetables like bean sprouts, pineapple, tomato, okra, and bac ha. Hoe/Hwe - This is a meal rather than an actual dish. Next time you're craving some sashimi, try the Korean version instead (and be sure to grab a bunch of friends.) Look for a restaurant that specializes in hoe and they will typically have special set menus that differ based on the number of people being served. Order a set dish and prepare to fest. 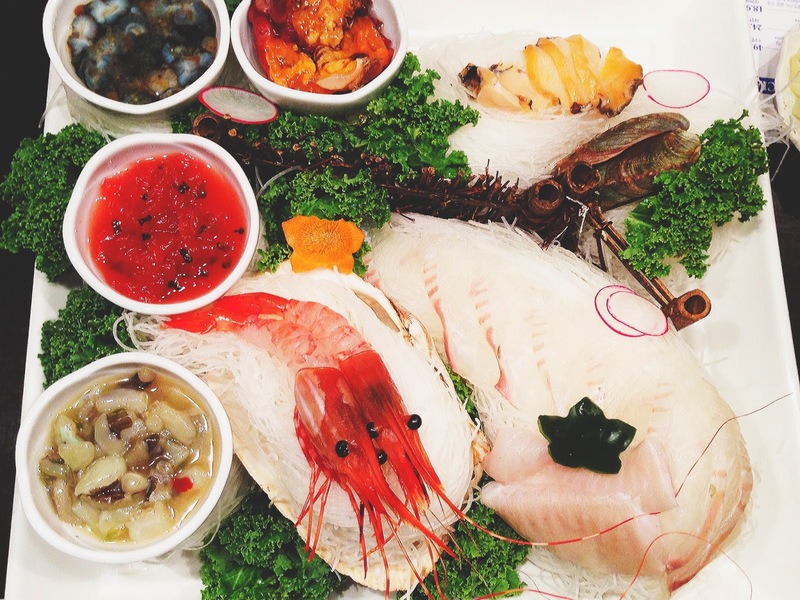 Typically, you'll first be given a bunch of appetizers like grilled fish, kimchi, acorn jelly, steamed egg, grilled shrimp, the list goes on and on (I usually see 8-10), followed by the main attraction: the raw fish. This is generally eaten with a spicy gochujang-based sauce. After the fish is consumed, the restaurant will bring out a spicy soup made from the bones of the fish with some extra vegetables and maybe tofu along with rice and kimchi. If the set is big enough, then there will be other things as well. Maeuntang - If you don't have a big group around, most&nbsp;restaurants will serve the fish soup on its own. It's a spicy-red, gochujang-based soup filled with fish, bean sprouts, vegetables, and mushrooms. Eaten with some rice and banchan, this is extremely satisfying on a cold winter day. Hwe du bap - I know bibimbap and chirashi are both quite popular, so think of hwe du bap as a mix of the two. The restaurant will serve you a big bowl of raw veggies and fish, a bowl of sesame-oil seasoned riced, and a bottle of gochujang-based sauce. Just dump the rice into the fish and veggies, squeeze on the sauce, mix, and enjoy! Soondubu - Another great soupy option for cold winter days is soondubu or soft tofu soup. There are typically restaurants that specialize in this stuff and offer a whole list of different options from beef to pork, seafood, vegetable, ham, dumpling, and so on. The default is that all the soups will have soft tofu and vegetables. My two favorites are seafood or mushroom. After you place your oder, the restaurant will give you a raw egg. Then, once the soup is brought out, it will still be bubbly hot. Immediately crack your egg directly into the soup and you can either just wait and let it become sort of like a poached egg or swirl it so it is an egg drop. I prefer the swirled. After you wait a few minutes for the soup to cool down, put some rice on the spoon, scoop up some of the soup, and enjoy! I don't have too much experience in Ethiopian cuisine, so this final category isn't too informative. I can tell you that getting a sampler platter is a great way to try out a bunch of different dishes. Ethiopian food is eaten with injera, a spongey flatbread made from teff, instead of utensils, and to be honest, injera is so tasty that I can just eat it plain! It's slightly sour, light, airy, and soft. As for the actual flavored dishes, the food is generally room temperature, heavily spiced, though not hot, and can be a bit oily. Still, paired with the injera, the flavors balance out perfectly!